This article is about the item that appears in the Paper Mario series. For the item from Super Mario Galaxy and Super Mario Galaxy 2, see Life Mushroom. Super Paper Mario Description Automatically restores 5 HP if you fall in battle. A Life Shroom is an item found in the Paper Mario series. Whenever Mario (or his partner in The Thousand-Year Door) is defeated in battle, the Life Shroom will revive the character and return ten HP to them. If both Mario and partner lose all of their HP at the same time, both will be revived to ten HP, but only one Life Shroom will be used. In Paper Mario, the first time a Life Shroom was seen as Princess Peach in Peach's Castle after Chapter 2. It was seen in the library at the top behind the railing but appears that Princess Peach is unable to get it since it's too high and there seems to be no way for Peach to get up to that top, but it is later obtained as Mario when he makes it to the castle in Chapter 8. One was also in an invisible ? Block in Dry Dry Desert. They later appeared in the Boo's Mansion at Igor's shop. Later on they appeared in both ? Blocks and in the shop in Star Haven. The second item Mario can buy from Rip Cheato will be a Life Shroom. They're also left by Li'l Oinks that are orange and have white spots. One of Koopa Koot's favors involves bringing him a Life Shroom as the old Koopa has been ailing and wants a Life Shroom to have on hand in case of an emergency. In Paper Mario: The Thousand-Year Door, the item can be bought for forty coins at the Twilight Shop in Twilight Town and for fifty coins at Westside Goods in Rogueport. One can be found in Hooktail Castle, Twilight Trail and the Palace of Shadow. At shops within the game, they are given away as a shopping prize when the player reaches one-hundred and fifty points. Life Shrooms are also found in ? Blocks later in the game. Life Shrooms can also be carried by an enemy in battle. When the enemy is defeated, the Life Shroom revives the enemy just as it would Mario or his partner; however, it then has a high chance of being dropped after the battle is over. In this game, it is not possible to save this item just for Mario's use; partners automatically use it if their life is depleted, no matter what. The Puni Elder also demands one of these as an emergency ration in the Trouble Center. They reappear in Super Paper Mario, but only recover five HP when Mario, Princess Peach, Bowser or Luigi falls. They can be used at any time to restore five HP and/or cure Poison. 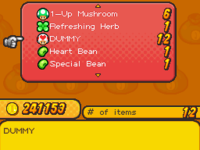 In the code for Mario & Luigi: Bowser's Inside Story, there is an item that looks similar to a Life Shroom named Dummy. If used (while inside Bowser), Mario (or Luigi) will throw it into the air, where it explodes and restores 60 HP to Bowser. The mentioned item was most likely scrapped from the game, due to the Sea Pipe Statue and Durmite bosses only being able to damage Bowser while in his body. It can still be obtained using Action Replay codes. This page was last edited on February 15, 2019, at 11:33.